Death Cab For Cutie: Getting Older, Staying Honest Members Ben Gibbard and Chris Walla discuss abandoning two of their band's trademarks, a guitar-driven sound and melancholy lyrics, on the new Codes and Keys. 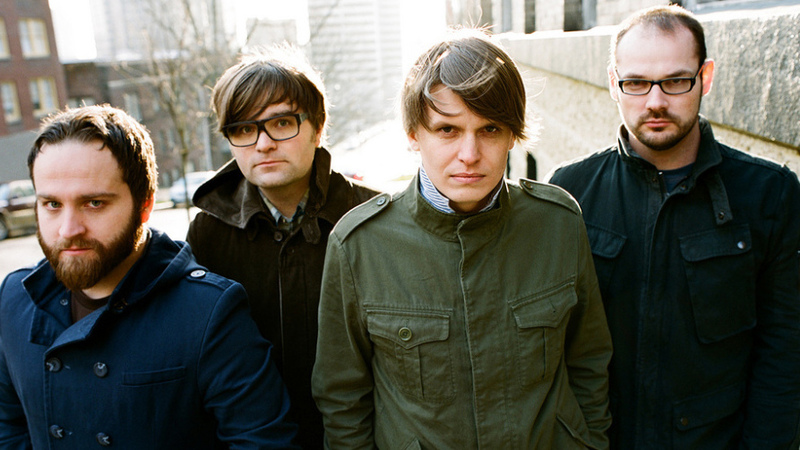 Death Cab for Cutie (from left): Nick Harmer, Ben Gibbard, Chris Walla, Jason McGerr. Hear Death Cab for Cutie's new album in its entirety until its release. Death Cab for Cutie, the rock quartet from Bellingham, Wash., appeals to the young — and the young at heart — with its songs about love and heartbreak. But its latest album, Codes and Keys, marks a departure from its characteristic melancholy sound. Chris Walla, the band's guitarist, keyboardist and producer, says it was time for a change. "We're 13 or 14 years and seven or eight albums — depending how you count — into this, and it just seemed like a good time to not make a really guitar-centric, guitar-focused record," he says. Codes and Keys arrives after big changes for Death Cab for Cutie's frontman and songwriter, Ben Gibbard. Since writing and recording the band's last album, 2008's Narrow Stairs, Gibbard has quit drinking, moved from Seattle to Los Angeles and wed actress and musician Zooey Deschanel. Gibbard says his marriage has had an impact on his writing. "Monday Morning," for example, is a portrait of his wife that opens with the line, "She may be young, but she only likes old things." "I feel that our music has always been really honest [about] the people we are now," Gibbard says. "As a songwriter, I'm not necessarily writing about myself or my life. But ... I would be remiss if I tried to continue writing in a solely melancholic voice, given the fact that now I'm a married man." Codes and Keys is a movement toward a more upbeat sound from Death Cab for Cutie, but Gibbard says the album retains a certain amount of balance. "[Codes and Keys' lighter songs] are meant to be palate-cleansing moments on the record," Gibbard says. "But there are also songs ... I feel have a weight and a darkness to them." Back when Death Cab for Cutie was getting started, Gibbard says, his heroes were the bands selling a few thousand records and making just enough money to get by. "What we aspired to in 1998, we have wildly surpassed," Gibbard says. "And I know we all feel incredibly grateful and lucky this band has been able to have the life that it's had."